Quick access to chemical spray can make the difference between life and death. The convenient U68 Leather Duty Economy Holder from DeSantis places OC spray within easy reach on a belt, allowing for a rapid draw under pressure. The pouch is made from tough, all black full-grain leather, offering both a durable and professional-looking appearance. The top snap closure secures the canister during movement without compromising ease of access. 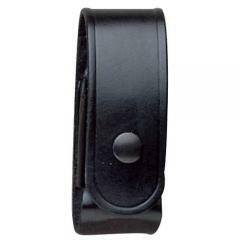 It attaches to a duty belt using a firm belt slot and fits widths up to 2.25-inches. The durable holder accommodates a two-ounce canister.